AMMAN - HE Dr. Talal Abu-Ghazaleh participated in the graduation ceremony of the Security and Special Protection (234) batch at the Airport Security and Protection Directorate in the presence of Brigadier General Nasser Mheirat, Assistant Director of Jordan General Intelligence Directorate and Brigadier General Dr. Nayef Mansour Al Ajarmeh, Director of Jordan Airport Security and Protection Directorate with the participation of officers and staff from the Jordan Armed Forces-Arab Army and other security apparatus. 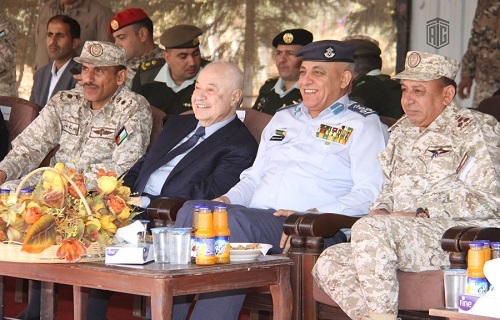 During the ceremony, General Mheirat presented a shield of appreciation and extended his sincere gratitude to Talal Abu-Ghazaleh Organization (TAG-Org) for its unlimited support to the Armed Forces – Arab Army in the fields of capacity building and training with the aim of enhancing creativity and excellence amongst staff of the security apparatus and armed forces and developing their innovative skills in the military field. At the closing, Abu-Ghazaleh presented General Ajarmeh with an honorary shield and awarded recognitions to graduates and highly commended the tireless efforts exerted by all security apparatus who strive to make Jordan a role model in its military and security advancement.